Biography and accomplishments or why Nefertari was famous: Nefertari married Ramses before he became Pharaoh. She was 13 and he was 15 years old. She held a position which had been unequalled by a woman in Ancient Egypt. She took part in both civil and religious ceremonies and accompanied the pharaoh on important journeys. Nefertari was even deified during her lifetime. Her importance and role of beloved wife to Ramses II is confirmed by the number of monuments dedicated to her name. Nefertari is also depicted in statues as being equal in size to Ramses II, a rarity indicating her importance to the pharaoh. The smaller temple of Hathor at Abu Simbel is also dedicated to Queen Nefertari. Monuments to Nefertari include the Rock Temple at Abu Simbel, her images can be seen at Karnak, Luxor and Heliopolis. 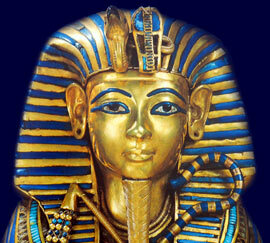 None of the sons of Queen Nefertari became Pharaoh, they died during Ramses long lifetime. The throne was taken by Merneptah (r1213 BC – 1203 BC) the son of Isisnofret, the second chief wife of Ramses the Great. Each section of this Ancient Egyptian website addresses all topics and provides interesting facts and information about the Golden Age of Pharaohs and of Nefertari. The Sitemap provides full details of all of the information and facts provided about the fascinating subject of the Ancient Egyptian Kings - their life, family, reign, dynasty, important dates and events and accomplishments.